← Support your favorite indies at Rhinebeck! So many of us have probably fantasized about opening a yarn store stocked with all the things we love, or about finding a studio and having a dedicated space for dyeing. Kat Koeller, the artisan behind paper and yarn, has actually done both. Kat opened The Thankful Ewe, a local yarn shop in Minster, Ohio, in 2011. She also dyes yarn, including the softly variegated Hues line, and creates popular Grumpy Stitch Markers. If running two businesses doesn’t sound like enough of a challenge, Kat has also been earning a teaching degree. I asked her to tell me about how she became a yarntrepreneur, and how she’s been able to pursue not one, but two of her dream jobs. Tell me how you got started dyeing yarn. I heard about a fiber dyeing tutorial on Knitty and decided to give it a try. By then I was already making stitch markers so it was a natural progression. I like the tactile-ness of creating a palette of colors on yarn. Fiber dyeing is also very science-y which makes my nerdy little brain very happy. 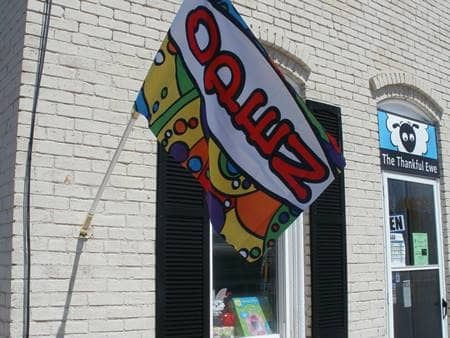 What made you decide to open up a yarn shop? We are based in a rural area of Ohio. I had been traveling over 30 minutes away to visit my first LYS, Ewetopia in Troy, Ohio. When they abruptly closed, the Late Night knitting group stuck together by meeting at Panera Bread. After about a year, one of the original Ewetopia owners opened a shop a few miles further down the interstate, Tippecanoe Weaver and Fibers Too in Tipp City, Ohio. I was happy to have a LYS in my area again, but the drive was getting to be too much to make regularly. Around the same time, my then two-year-old secretly began shoving all my crochet hooks, one by one over a few months, into our old TV set to change the station (once discovered we found 14! of them inside the TV). Several long road trips to acquire new hooks later I realized how much my area needed an LYS too. Originally I sold crocheted baby shoes and hand-dyed yarns at the local farmers’ market. While there, it became apparent that our area had a large fiber arts community, but they didn’t meet much or know about each other. We started meeting at the markets in the summer and coffee shops in the winter. With the help from a core group of fiber friends I opened my personal studio up in November of 2010, and once a permanent home was found we moved the whole operation to Minster, Ohio in April of 2011. Luckily for me, Kay, Tippecanoe Weaver’s owner, has continued to be an amazing sounding board and wealth of information. Is it a challenge juggling two separate businesses, or do they complement one another? Originally, the yarn shop opened as ‘paper and yarn,’ and we separated out the dyeworks from the shop last June, creating The Thankful Ewe to make it easier to grow the wholesale side of paper and yarn. The shop is basically a working studio (or at least that’s the excuse we use for all the projects laying out on any given day at the store) where I do all my work for pny too. You’re also earning a teaching degree. Do you have plans to go into teaching? And… how do you manage it all?! I am looking forward to finishing my master’s degree in the spring. Going to school full time has become increasingly difficult as my program requires a lot of extra classroom time and course work. A full-time teaching job will actually require less hours, which sounds weird. It has been an interestingly crazy adventure, but I wouldn’t want it any other way. It’s not too often in life that you can pursue both your dream jobs at once. I can’t say enough about the support I have received from my husband, parents and the local fiber arts community, including my shop instructors. When things get to be too much, I have them to lean on, give me perspective and push me to keep chugging along. I’m still in a daze about how we’re managed to get through all the school work, weather and road construction. It’s been an amazing ride. After graduation, I plan to continue the shop too. We have a lot of very skilled individuals and it makes me proud to know that I have the potential to help support those folks as they support our community of crafters. 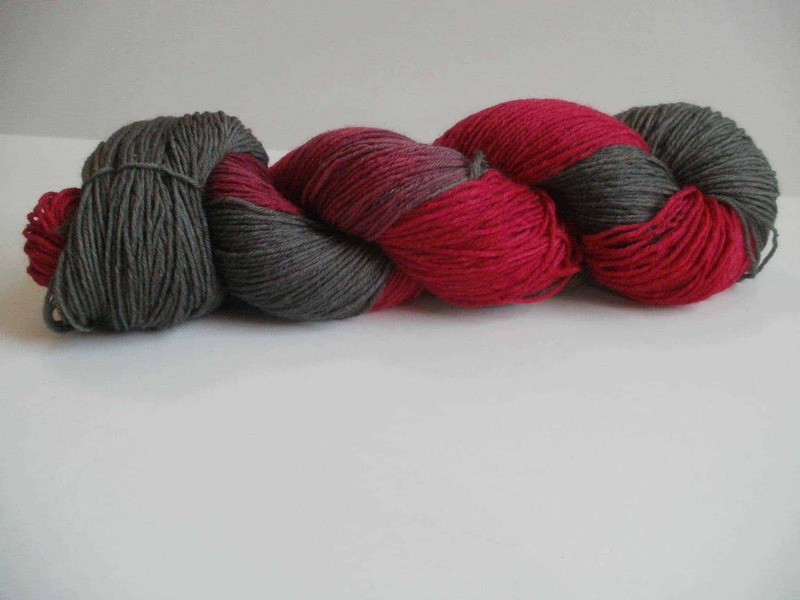 When dyeing, what kinds of colors do you gravitate toward? I’m kind of a split personality on colors. I like creamy pastels, which was where the inspiration for the Hues line comes from, but I also like moody, layered colors with a pop of accent, too. Your Hues line of tonal monochromatic colorways is gorgeous! What inspired those colorways? Thank you. 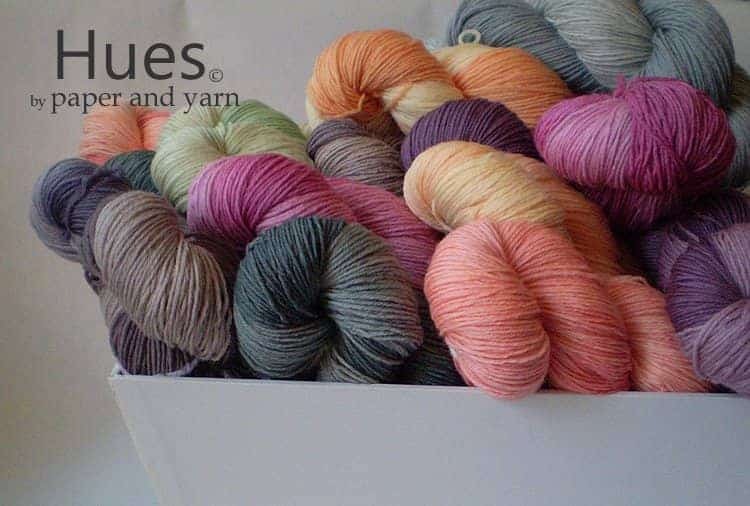 Aside from my color preferences, I wanted Hues to focus on providing a softly variegated yarn for lace work or for customers who don’t want a busy yarn. They are similar to a kettle dye in texture but have a more predictable repeat of lights and darks. I also love your “grumpy” stitch markers. 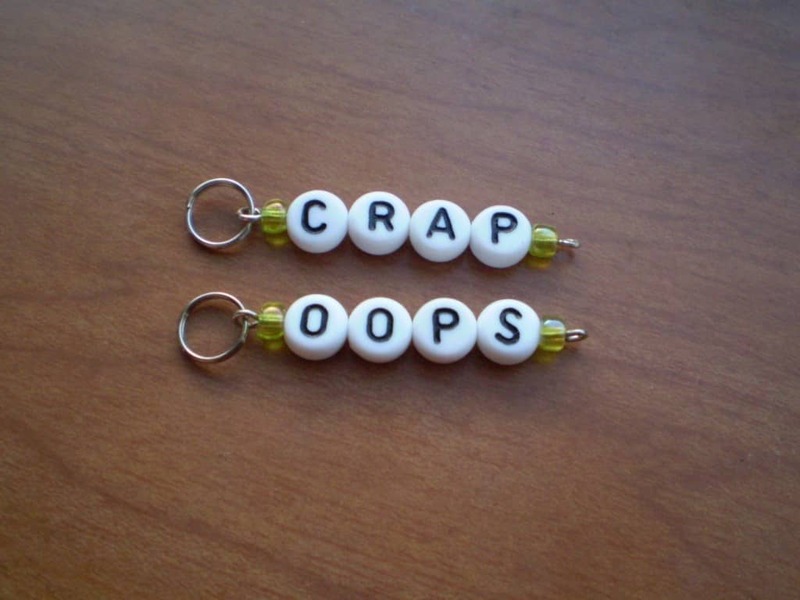 Since you do custom work, has anyone ever requested something more spicy than “crap” or “oops”? Oh yes, I have a few favorites that have come through the pipeline before but I don’t think I can include what they really said on this site 😉 The stories customers send me really make my day too. It really is okay to get angry at your projects once in a while. Frustration can be a great motivator if you don’t take things to seriously. 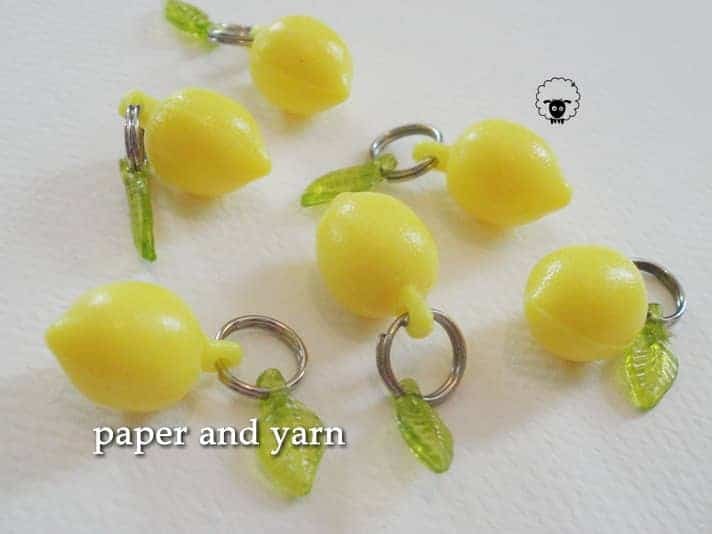 I have received quite a bit of feedback over the years from people buying them for new knitters to help ease the stress of learning a new skill. What’s next for both paper and yarn and The Thankful Ewe? For paper and yarn, we are introducing two new bases, one sock yarn which is only available to LYSs and one new super-soft, washable Merino worsted called Bumble Bees. I also have a few new phrases to add into the stitch marker mix. For the shop, we have the I-75 yarn crawl coming up in August. The crawl was started last year as a local shop hop. Since it was going to follow Interstate 75 I thought it was be fun to see how many shops we could get to participate. I was hoping for five or six at first and then maybe 10. Last year blew me away when we had 13 shops sign on, from Perrysburg, Ohio, near Toledo, all the way down to Crescent Springs, Kentucky. This year we have at least 17. It’s going to be awesome and completely nuts! 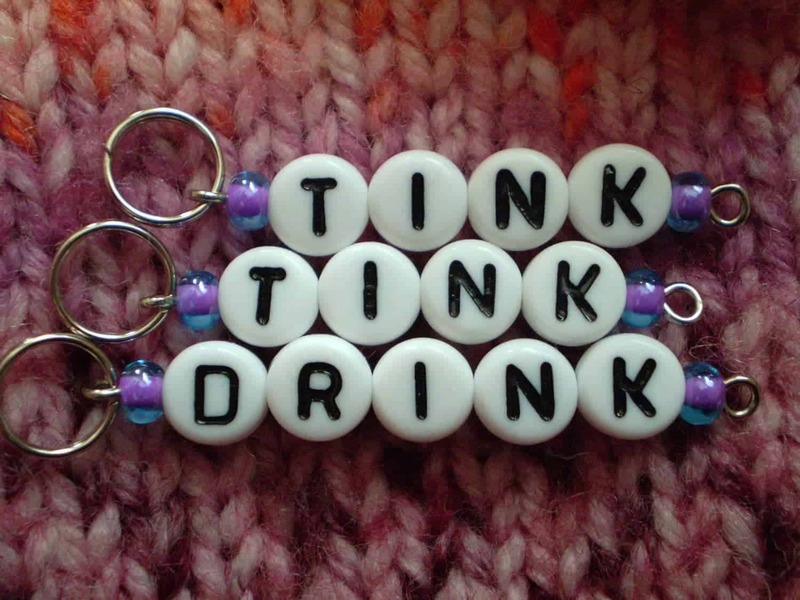 Kat has offered a set of custom stitch markers to a lucky knitter. To enter, comment on this post with three words you would want on your stitch markers — they can be “grumpy,” using your favorite curse words, a la Ravelry, they can have your favorite knitting words or they can be totally non-knitting related. You have until the end of the day EST on Monday, July 28, to comment, and then I’ll pick a winner via random number generator. Have fun and good luck! 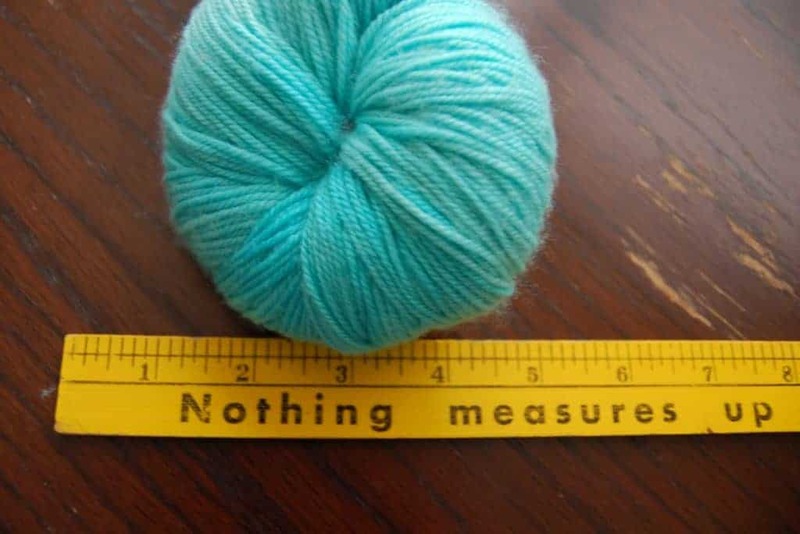 How about ‘knit’, ‘purl’ and ‘cuss’? 🙂 LOL! I visited the shop on last year’s yarn crawl and look forward to visiting again. Well worth the drive! The Hues colors are simply stunning. My words are: Crap, Oops, and Tink. seems appropriate, since I like to watch nerdy tv while I knit. Kat has been a very good friend to make thru crafting. She’s introduced me to several new yarn lines and accessory lines. Stop by the shop… YOU won’t be disappointed!!!!! We appreciate all your efforts you show towards your patrons, Kat. We love LINDA too! Way to go Kat! So glad to have you around.